I just finished watching What’s New in Swift from WWDC 2016 and wanted to pass on the highlights for you. “What’s New in Swift” is great session that I highly recommend you also watch for yourself. There are a couple things that jump out at me that I feel are worth writing about. Granted some of these are a little “soft” and not well defined, I really like the first goal. 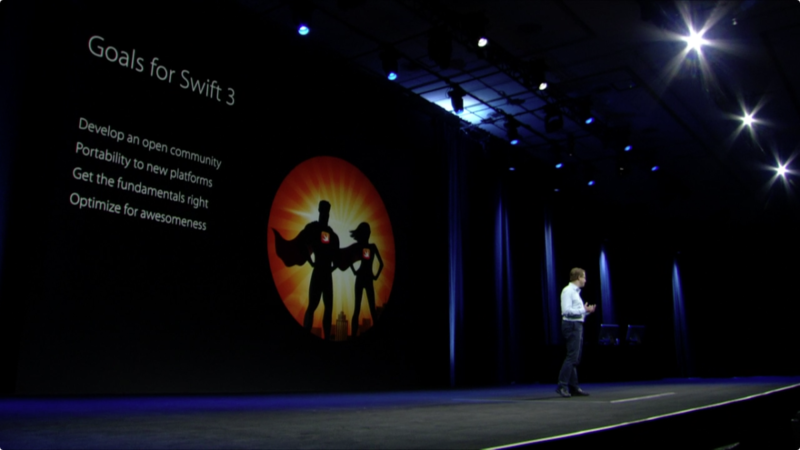 On stage, Apple did not hold back in describing that Swift 3 will be the result of total community involvement with the languages evolution – which is exactly the desired intention. This totally hits home for me. Even though I haven’t been an active participant in the language’s evolution, I’m a firm believer that the open source software model leads to better software, and for something as critical as the language that I could be using for the foreseeable future, I’m happy that it’s being evolved in such an open model. The presenter then went on to talk further about the Dock with some really revealing information. Internally, there’s actually a lot of stuff I consider general “OS functionality” that Apple actually classifies as the Dock app. Can you believe all this is included in the Dock codebase? What’s interesting about the Dock app is that a significant amount of Swift code was written for it in the El Capitan release, 10s of thousand lines of Swift code out of a total of 200k lines of code total. This is interesting because it represents a case study of a non-trivial amount of code that will be migrated from Swift 2.2 to Swift 3.0, and Apple did just this. The migration resulted with about 15% less actual code! Not to mention that the engineers like the safety features of Swift as well as the more articulate code. Socialize your idea idea on the mailing list. Once critical mass is achieved, the idea becomes a formal proposal on GitHub. Formal review of the proposal happens once the pull request for the proposal merges into the repository. Formal review happens on the mailing list, out in the open. Core team arbitrates a decision. The rationale for the decision is always documented, regardless of whether the proposal was accepted or rejected. All proposals, past and present, can be found in the swift-evolution repository. A direct result of this is the libdispatch renaming that I wrote about a couple weeks ago. Additionally, one of the weirdest and hardest things to get used to in Objective-C for me (a prior Java developer) was it’s incredible verbosity for the sake of verbosity. Chris Latter provides a bunch of examples on stage of this new clarity, and I’m loving it. There is a lot more information in this session, “What’s New in Swift”, especially some in-depth discussion of improvements and cleaning-up of Swift 3 syntax, as well as some information on tool improvements when using Swift. One of the closing statements of “What’s New in Swift” recognized that Swift 2.3 will be a total interim step towards Swift 3, most notably, Apple recommends getting Swift 3 migration into your project plans. And certain tools like the Swift Playgrounds iOS app and the Thread Sanitizer already require Swift 3. Luckily Xcode 8 comes with a nifty converter. Did you watch this session, “What’s new in Swift”? If so, what are your impressions?